Now that Big Idea Mastermind‘s system is launched and running smoothly, I started to promote the landing pages available. I am doing Media Buys, Solo Ads and Sponsored tweets in addition of the free traffic I generate. Are the BIM landing pages optimized? Well, I am impressed. 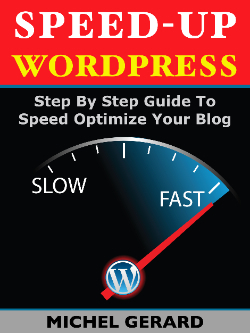 Just sending little traffic to one page produces leads. You can see with the white circles where on the page visitors place their mouse. 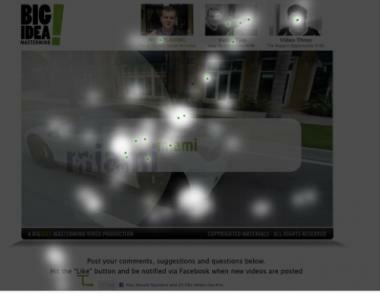 And the green little dots show where they have clicked. There is one click on the “Volume” icon suggesting someone was expecting an audio to play. The other green dots show that people have filled their email address and clicked the “Send Me The Free Video” button. Anyway, I get leads in my GetResponse list to confirm this. This is just a small amount of traffic and as more is sent the HeatMap will get very crowded. If you are wondering which software I am using, have a look at all it can do, click here. When I look at the other stats, it’s also very good. I am looking specifically at the Attention Rate, which is a percent of the people staying more than 20 seconds: 72% is excellent. Then I look at the Interest Rate, which is 60 secondes on site, here 45%, which is good. The third value is the Desire Rate and is not very relevant to a simple landing page without a video as the value is 300 seconds on site. 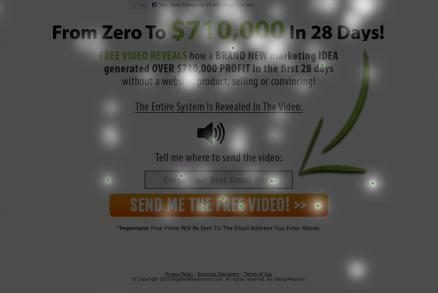 Now let’s have a look at the Video page after prospects have entered their email address in the landing page above. The attention is around the video with clicks on it. There are also clicks on the second and third videos images at the top, which show that people have an interest watching them. They will be made available to them later. These are results with 9 visitors. All the values are higher now. The Attention Rate is 88%, the Interest Rate is 77% and the Desire Rate is 22%. As there is a video on the page we start seeing results in theDesire Rate, people who are staying more than 300 seconds on the site. 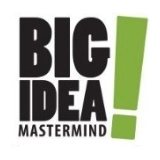 Are you a member of Big Idea Mastermind?